Are mobile homes eligible for repair or replacement? The Program will provide mobile/manufactured home owners with the funds to purchase a new manufactured home which must be located on a site outside of the 100 year floodplain. The Manufactured Home Retailer/Installer Guide fact sheet describes the Program requirement for both the Applicant and the mobile/manufactured home retailer/installer. If you have any questions or concerns please call the special Mobile Home Assistance Line at 844-212-9711. What requirements must I meet before the Program releases funds to me? Before the Program can release the first 50% payment of your Repair award to you, you must select a designer or contractor and provide their name and license number to the Program. Your file must have also met certain basic eligibility criteria, including verification that you owned your home at the time of the storm; and a federally-required environmental review and approval of your project. Applicants who have ONLY a Reimbursement award (with no prospective work to be done) need to provide ALL required documentation necessary for the Program to review and to close out their file, in order to receive payment. How do you notify me that I have a check to be picked up? The Program will contact you either by telephone, email, or U.S. mail. If you have provided the Program an email address, then you will receive email notifications from [email protected], which will include an award calculation table and a Grant Agreement, that you can electronically sign and details the check amount to be picked up. If you do not have an email address, then the Program will mail the award calculation table and Grant Agreement to the mailing address you provided the Program at time of application. Are there any restrictions on how I can use my reimbursement money? The reimbursement funds are intended to repay you for repair costs you already incurred. How do I get my award changed from a repair award (AA/ECR) to a reconstruction award? 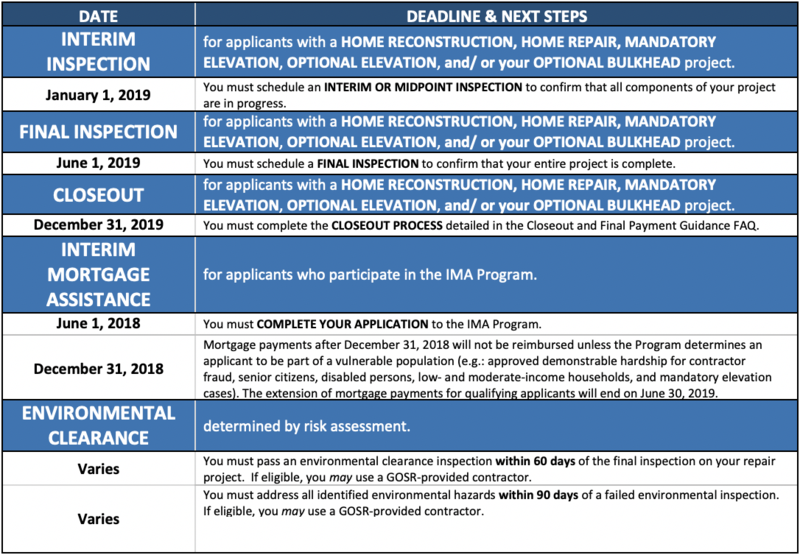 The Program can convert your Repair Award to a Reconstruction Award if you either submit a Substantial Damage Letter (SDL) issued by the municipality dated prior to 02.20.14 with damages stated in excess of 80%, or an accepted Feasibility Analysis Report (FAR), prepared by your Design Professional.